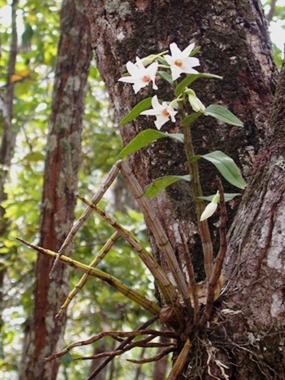 A wild Dendrobium draconis (Orchidaceae) is here growing on the bark of a Thai oak (Quercus kerrii, Fagaceae). It is situated 2 meters up in the tree and is facing east. This species is well adapted to dry environments and if you buy CITES certified individuals from the flower market you can use them to provide blossom in deciduous trees in your monsoon garden. Our experience from this forest was that the bark of Shorea obtusa (Dipterocarpaceae) seemed to harbour both many orchid individuals and many orchid genera. Unfortunately, this tree grows slowly and has been logged heavily due to its excellent timber. Trial and error is a good way to learn the mysteries behind ‘green thumbs’. Reading a few good books will also save you time and money in creating a lovely garden from scratch. Another way to learn how to make an environment suitable for plants, is to simply observe them in nature. This is important if you move to a new climate and new soils, where you humbly may have to modify strategies and techniques from your previous garden. Last Sunday Dokmai Garden arranged for a jungle tour to the Chiang Rai province. The exact location is kept secret due to risk of orchid theft. We followed a stream to study a moist climate and its inhabitants, and then we hiked up to a dry ridge. Although most teak trees have been logged and the new secondary forest is void of large trees, it seems as if old uncut lianas might have been the reservoir for epiphytic orchids, from which they now slowly spread to the present trees of the Dipterocarpaceae family (D. obtusifolius, D. tuberculatus, Shorea obtusa and S. siamensis). Although the initial clearcut wiped out most orchids, you can still find some fragments in this new forest.